Lotsa tasty love at the Loveless Cafe | Best Road Trip Ever! Fried chicken and biscuits. Need I say more? Beginning as a party house in the forties, the little white structure that sits next to the Natchez Trace had one of the largest hardwood living room floors around – perfect for dancing the night away. Weary travelers found comfort and refuge in the cozy home and in the food the owners served. 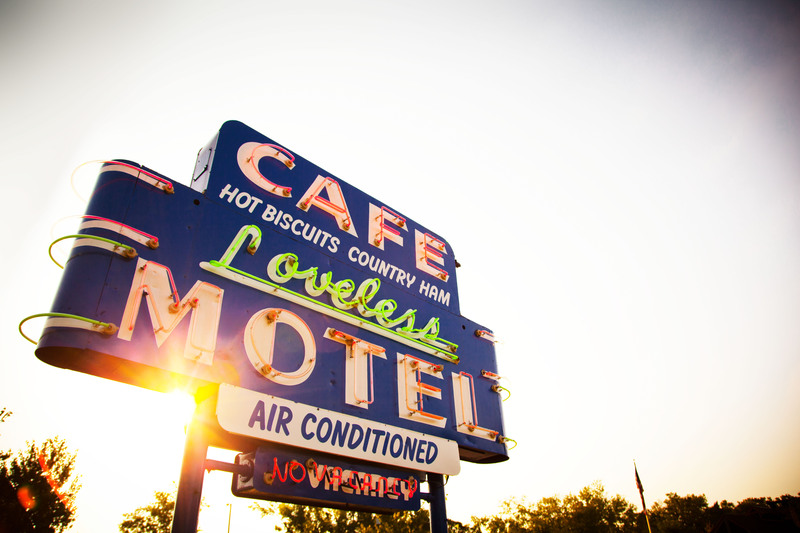 As the tiny house became a planned stop for treks along Highway 100, the then private home became known as the Loveless Motel and Cafe. Lon Loveless built and ran the property’s 14 motel rooms while hungry crowds were drawn to Annie’s homemade preserves and scratch-made-biscuits – a secret recipe that remains unchanged to this day. Despite cultural changes that dot the timeline over the years, the Loveless Cafe remains true to what started it all in 1951: Serving true southern comfort food, encompassing a time when people ate what was indigenous to where they lived. Before the “super highways,” the rural South was a remote area with back roads leading to treasures known only to those who ventured down them. For years the Loveless was one of those treasures, located just yards from the northern terminus of the Natchez Trace Parkway, one of America’s oldest roads that extends south from Central Tennessee 444 miles to Natchez, Mississippi. It is just crazy-amazing? No. But it is a pretty good breakfast. Recommended by the deep south aficionado, Deep Fried Kudzu. (http://www.deepfriedkudzu.com) Notable Road Food! Also, be sure to check out http://www.roadfood.com for a full review of this spot!